"Little Superman 3D" is reviewed as an entertainer with graphics of international quality. 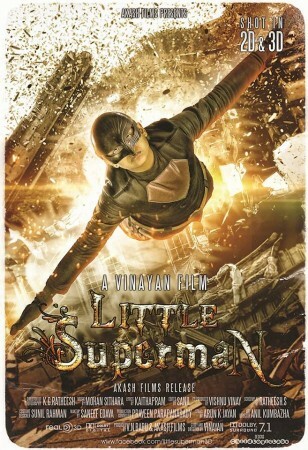 The latest Malayalam 3D movie "Little Superman-3D", directed by Vinayan has opened in theatres to positive reviews. Reviewers have appreciated the director for his efforts to bring out a visual treat and an entertainer, meant for children and adults alike. Though the story of the movie doesn't have much freshness to offer, the film reportedly will surprise you with its graphic works. The story of the movie revolves around 11 year old Villi Wilson (Deny), who is Wilson George (Ranjith) and Jeny Wilson's (Praveena) son. Ansiba Hassan plays the role of his sister. Wilson is a loving father and a dedicated irrigation department officer. His sincerity towards the work has also gained him enough enemies who eventually hunt him and his family down. Villi and his pet dog escape and his uncle Alby will take care of them. With the help of his uncle, Villi gets some magical powers and become the little superman. The rest of the film focuses on how Villi tracks down those who killed his family and takes revenge on them. The film's graphics are reviewed as stunning and first of its kind in Malayalam cinema. The other technical aspects of the movie have also managed to impress the critics. Here are some of the reviews of "Little Superman 3D" by various critics.